music. Stella has been singing for a few months in a band called Thunderbird. Then she once again gave up the music for one and a half year because pub music did not fit to her personal vision of art. Stella has been working as a disributor of cosmetics, but she has been in a wrong enviroment there. She left her job and has been working the same but free-time for one year, trying to gather a serious band. Since in Bulgaria it was impossible to do the music she wanted to sing and compose, she started looking for a chance and labels abroad. After desperate affort, she stayed strong and sent five CDs with her best demos, even though she had no band but only some rough drafts for songs. After a month she got her first answer from Lion Music (Finland). The great guitarplayer Lars Eric Mattsson "fell in love with her voice". He wished to produce her project. Stella was very excited that she was allowed to write her own lyrics, to choose the name of the band and to write the music responding the vocal lines. So this is how the first home demo with only vocals and acoustic guitar flew away from Bulgaria to Finland. Lasse Mattsson decided that Stellas ideas would fit perfectly to the style of the swedish virtuoso guitar-player Thorbjorn Englund who has been working only with his own band Winterlong until then (visit his web-site www.winterlong.org). So he agreed to arrange Stellas music. This is how the main body of StarQueenhas been already formed. Stella, Thorbjorn and Lars Erik Mattsson kept in touch via mail, discussing ideas about the project. Stella and Thorbjorn has passed through the mill during their lifes to make their musical dream come true. They say it is a result of hard work and sacrifices. So they have found so muchincommon in their souls and interests. They have been lonely but after the destiny connected them from so far away, they could chase their dreams together. They say that they have been feeling alone then, so it happened at the right moment to start their personal relationship. Thorbjorn went to Bulgaria. And in a period of one and a half year Stella moved to live togther withhim in Sweden. Faithbringer was recorded in a strange way; Thorbjorn Englund recorded all the guitars in his own Studio in Kalix, Sweden. Then the bass player of Winterlong - Erik Tornberg joined. He also recorded in Thorbjorns studio. Then Thorbjorn brought the ready music, so Stella, recorded the vocals in Bulgaria, in the studio of her old friend Vladimir Tanov. There are two back vocalists in Faithbringer, also from Bulgaria - Kalina Doncheva and Borislav Mengov. The drums were recordedbefore the vocals in Lion Music studio with the finish drummer Tony Eriksson. The last in the cyber chain was Bob Katsionis - a virtuoso keyboard player from Greece. He also had already released debut on Lion Music then, called Turn of My Century. Bob recorded keyboard solos in 8 songs (except the 2 ballads in the album). Finally, Lars Eric Mattsson has mixed & mastered the album, He played all the basic basic keyboards and some additional melodies. 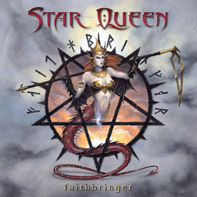 The artwork of Faithbringer and the logo of StarQueen are designed by Eric Philippe, who has made the artwork for legendary artists like Rhapsody, Gamma Ray, Riot, Lions Share and many others. Lion Music produces good quailty music - styles like progressive rock and neoclassical metal. They are not commercial big label. They are working for the art itself. 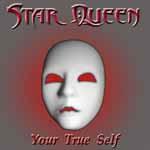 So if StarQueen has been planned as a long standing and developing studio project, they´ve been woking very hard to show out their music live. Stella and Thorbjorn don´t respect those bands who pretend to be so big & great but out of the studio they are one big nothing. Because of the international membership in StarQueen and the low budget, the band could not perform a tour after their debut album. Also changes happened in Winterlong, So Thorbjorn split his old singer and Erik Tornberg. Erik, the bassplayer wasn't in touch with Starqueen for several months and he was uninterested in the band. Thorbjorn has called his old friend Peter Uven who liked the music of Starqueen. So he joined them. Peter Uven plays in lots of projects. During the records of Your True Self, Erik Tornberg came back to Winterlong. At the same time Erik joined back StarQueen as a rhythm guitarplayer. Finally, Peter Uvén found a drummer - that wonderful musician andperson Mats Homla. But unfortunetly, StarQueen was forced by economical cirumstances to stay a studio project.